Looking for an ideal travel destination that includes beaches, historic charm, outdoor recreation and arts and culture? Come to St. Augustine in Northeast Florida, and you can experience all this and more. No trip to St. Augustine would be complete without exploring St. George Street, the city’s historic district. Whether you choose to walk or opt for the trolley ride, you will be charmed by all the colonial Spanish architecture flanking both sides of the street. There are plenty of historic buildings here to visit like the old City Gates, St. George Tavern and the nation’s oldest wooden schoolhouse as well as quaint shops, art galleries, restaurants, ice cream parlors and hotel accommodation. 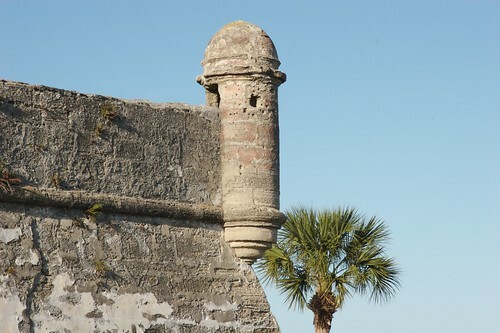 Another must-do in St. Augustine is tour the Castillo de San Marcos National Monument, a fort built in the late 1600s by the Spanish to defend the city. Situated on the banks of the lovely Matanzas Bay, this historic fort remains the oldest of its kind in the continental United States. As you tour this imposing fort and its ramparts and interior of empty rooms, guides dressed in period garb regale you with the fort’s interesting history. Don’t miss out on the reenactment of the cannon shooting. Adults and children alike will love visiting the St. Augustine Alligator Farm. Here, you can see a variety of alligators from babies to huge adults and even albinos. In addition to the alligators, you can also see a number of other species here such as monkeys, exotic birds, Komodo dragons and pythons. The Fountain of Youth Archaeological Park is a 15-acre memorial marking the spot where it is believed that explorer, Ponce de Leon, landed. Here, you can see a number of Spanish and Timucua artifacts and drink from the fountain. When you are not exploring the city’s historic sites, the St. Augustine Beach is a great place to relax and play. With miles of beautiful white sand, this beach offers swimming, surfing, body-boarding, seashell collecting, cycling, bird watching and dolphin watching. St. Augustine offers a number of art galleries and cultural museums where you can experience the city’s colorful history and art. While the St. Augustine Art Association is the city’s premier art gallery, the High Tide Gallery also presents an impressive collection of art. The Colonial Spanish Quarter Museum features a recreated colonial village where you can see how people lived and worked here in the 18th century. At the St. Augustine Pirate and Treasure Museum, you can view a collection of authentic shipwreck artifacts including a pirate treasure chest. What’s more, St. Augustine offers several walking tours both day and night where you can indulge in the city’s historic tales of ghosts, pirates, explorers, scandals and love stories. Many people like to visit St. Augustine for its nearby outlet shops where you can find a bargain on name brand items like Calvin Klein, Polo Ralph Lauren, Tommy Hilfiger and more. A couple of the largest outlet complexes include the St. Augustine Premium Outlets and Belz Factory Outlet World. If some outdoor recreation is desired, look no further than the 1,600-acre Anastasia State Park, where you can enjoy activities like swimming, fishing, surfing, kayaking, picnicking, camping, hiking, bird watching and much more. St. Augustine experiences a humid subtropical climate where summers are hot with occasional thunderstorms and winters are mild with a few freezes. Spring and fall present the most pleasant times to visit. Are you ready to see beautiful St. Augustine? Check out the great online deals that are available, and begin planning your trip today.